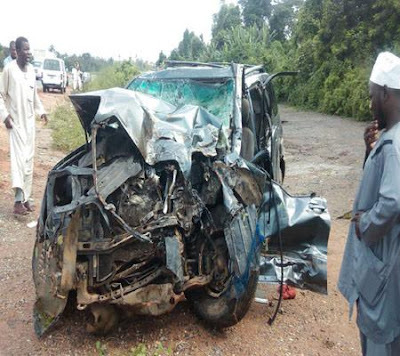 The Deputy Vice-Chancellor-designate of Fountain University, Osogbo, Prof. Abdul Hakeem Mobolaji, his 14 year old son, Muhammad and four others died in a car crash along the Lagos Ibadan expressway on Sunday September 20th. According to The Nation, the professor of Econometrics was traveling with his two sons, the late Muhammad and Abdul-Hafiz as well as one of his friend, Mr Abdul-Rasheed Attah, a lawyer, when a commercial bus rammed into his SUV after overtaking another vehicle on the narrow road. The road had been partitioned by the contractor working on it. Professor Mobolaji and his son died on the spot. His friend Attah and the late Mobolaji’s second son, AbdulHafiz were injured. Attah immediately called a relative and gave his phone to a woman to inform the person of the accident. Shortly after, he and Abdul Hafiz went into a coma. Four people including the driver of the passenger bus died in the accident. Speaking on the sad incident, the deceased professor’s son, Abdul Azeez said “Who will take care of us now that he is late? I was expecting to link up with him at Fountain University today (Monday). I was calling his phone on Sunday when I didn’t hear from him whether he has reached Ibadan where he was expected to pick other family members but he wasn’t picking his calls. I called him severally up to 30 times but no one was picking the call. I called the MD of Al Barakah Microfinance Bank to tell him that I have been calling my father but he was not picking his call that he should help me call him but later he came back with some people to announce his death that Allah has taken him back. I pray to Almighty Allah to grant the family the fortitude to bear the loss because he was the bread winner of the family and no one else.”. The late professor and his 14 year old son were on Monday buried in Akinyele Local Government Area, Oyo State.